Planning your Melbourne Wedding Video wedding day timeline can be a bit of a daunting task. Photographers, Melbourne Wedding Videographers, family, venues, florist, cake maker the list goes on. Having shot over 200 weddings we have planned a lot of wedding timelines and there is nothing overly complicated or secret about the process. We are going to share our process to help you plan your wedding day timeline well in advance of your wedding. Lots of details will change in the lead up to your Melbourne Wedding, however, your ceremony time is usually something that is locked in fairly early in the Melbourne Wedding Planning process. This becomes your starting point. See here for our aisle walk tips. We then work backwards from the ceremony time allowing 60 minutes for pre-ceremony setup and filming. Your Melbourne Wedding Videographer is going to need time to get setup for the ceremony. We film with up to 4 cameras for the ceremony and just as many audio recorders so this setup will take us some time. 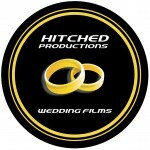 Allowing an hour also gives us time film your guests arriving for the start of the ceremony. It also gives us a bit of a buffer should bride preps be running a little behind. The exception is when filming Melbourne Greek Weddings, we tend to only allow 30 minutes for the pre-ceremony as there is often a wedding scheduled prior to the one we are filming. In most cases bride and groom are in different suburbs unless of course your wedding is at a venue such as Potters or Immerse that can cater for your entire wedding day. There is usually a bit more happening at the bride preps than the groom preps and therefore we allow 60 minutes with the groom and 90 minutes with the bride. We also factor in any travel time between the two as well as the travel time (if applicable) between the bride preps and the ceremony venue. We then jump back the ceremony. Is it civil or is it a more formal service? The typical civil ceremony is about 30 minutes and a church service is closer to 45-60 minutes. We then need to allow time for the post-ceremony congratulations where your guests will have the chance to congratulate you both. This one is time and sunlight dependent and can vary from non-existent to as long as 30 minutes. Your photographer will be your best person to speak to regarding this as they will want to make the most of the available daylight for your family and bridal party photos. Family photos can take anywhere from 15-30 minutes depending on the size and dynamics within your family (it’s a reality of life in 2019). As a rule of thumb, for winter weddings with a late start (3.30-4.00pm) we allow about 15-30 minutes for the post-ceremony as we race against the daylight. Earlier winter weddings and summer weddings do not have as strict a time allowance. This is what we call the photos and video of you and bridal party and can vary from a single location to as many as 3-4. As a rule of thumb this generally takes about an hour but again, it is dependent on the time available. If you wedding is 1.00pm in the afternoon, you might have 2-3 hours for this. If you wedding is 4.00pm, it will be closer to an hour and generally in the one location. We divide this time between you and your bridal party with the majority dedicated to the two of you. Our aim is to have you back at the venue with at least 15-30 minutes to give you time to relax and chill with each other prior to making your formal entrance at the reception. The reason for this is that you will not have seen each other all day and weddings are go-go-go, so it is nice to give you a chance to relax, have a drink and reapply make-up before the craziness known as a ‘reception’ kicks in. Your venue will take care of the reception timeline for you. Our advice is, follow the format that they suggest as they have been doing this a long time and know what works. See our other Melbourne Wedding Video tips for advice including Speeches, Master of Ceremonies and Bands. 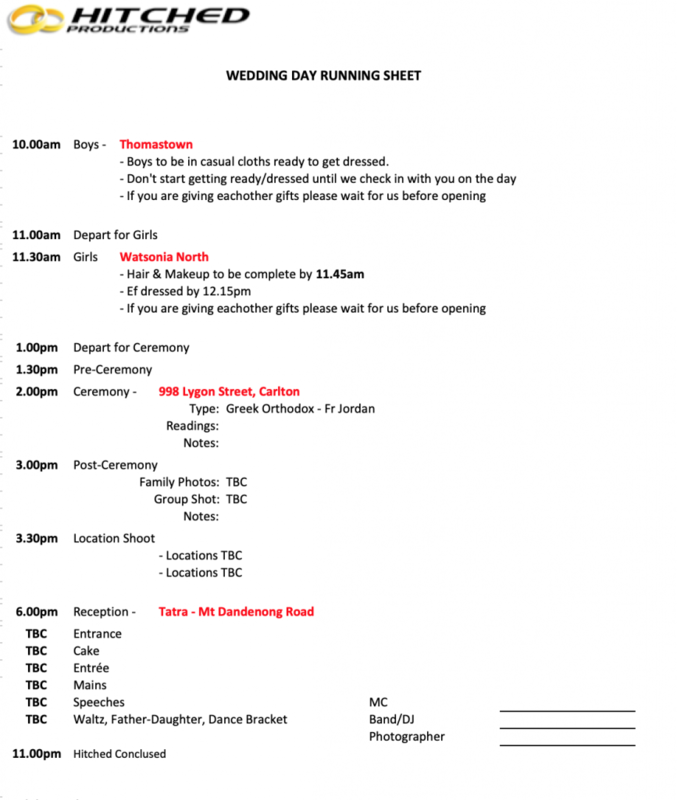 Planning your Melbourne Wedding Video timeline is not as complicated as first thought. Ultimately it will be your Melbourne Wedding Videographer and photographer that will govern the times prior to the ceremony and up to the reception. From there, your venue will take over. We have found over the years that th above system works for both us the photographer. We will sit with you about a month prior to your wedding to formalise the timeline. In the meantime, hopefully this helps you plan your timeline so that you can coordinate your other vendors and your family. Good luck!